At our household, every Sunday is devoted to cooking snacks and treats for the family to eat throughout the week. There is nothing like enjoying homemade cookies, muffins, brownies, and cupcakes! Not only does it leave a sweet aroma in the house, it’s also a perfect time to get together with the kids and bake as a family. Toddlers love to mimic their parents, so give them a plastic bowl and spoon to mix pretend batters or salads. Once you feel they are ready to prepare real food involve them in simple cooking projects like whisking, rolling balls, stirring, and helping pour out a measuring cup. Even when my children were babies, I would put them in their high chair beside me when I was cooking and showing or describing to them what I was preparing for their meals or snacks. The best part about cooking with my kids at an early age is that as teenagers they continue to help out in the kitchen by cooking meals or preparing snacks. For my daughter’s 20th birthday party, we made Rocky Road Peanut Butter Snack Bites for our guests to eat as snacks during the afternoon. When I showed her the recipe, she couldn’t wait to make them with me. Of course she loves all recipes made with chocolate and peanut butter, therefore I really did not have to convince her much to help prepare them. Even her birthday cake was prepared with peanut butter and chocolate ice cream. We had a great time talking about her favourite TV shows while listening to the radio, and she even asked me what I wanted as a gift for Mother’s Day! The special bonding moments you make in the kitchen with your children are so precious! 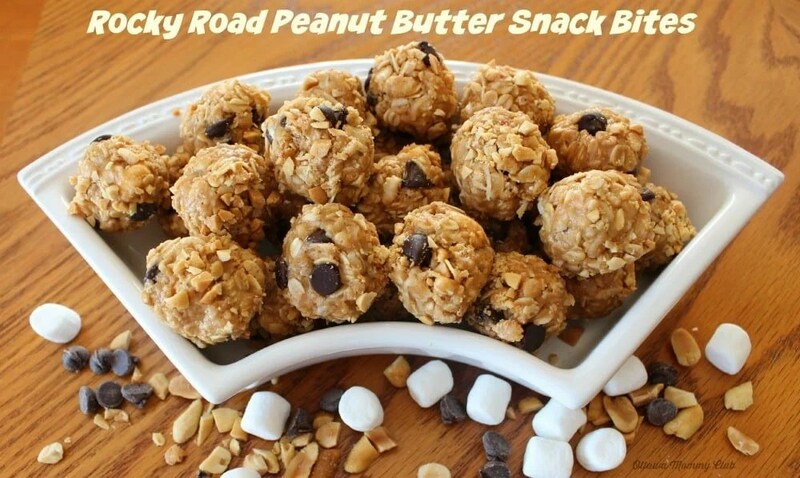 The Kraft Peanut Butter Snack Bites recipes are very versatile and easily customizable to your own taste and likes. Why don’t you create your own memories or experiences in the kitchen and share your very own Peanut Butter Snack Bite recipe online for a chance to win great prizes! Visit sheblogs Canada to enter the “Make It Yours Photo Contest”! you will be entered to win 1 of 4 Kraft Peanut Butter prize packs! This no bake Rocky Road Peanut Butter Snack Bites recipe is so easy to prepare and only takes about 20 minutes to make. This recipe of my version Rocky Road Bars put into Peanut Butter Snack Bites. MIX together all ingredients (except for the roasted peanuts) in a medium bowl until blended. FORM mixture into 20 (1-inch) balls, using about 2 tbsp (press firmly when forming). ROLL each ball in chopped peanuts, pressing to coat. I’m not a big marshmallow fan (so plan to leave those out), but am craving these after reading the recipe! These sound awesome and yummy! My daughter, who just gave birth has been eating these with just a couple of differences since her baby was born! These would disappear rather rapidly at my house. Mostly my fault! I cannot resist peanut butter with chocolate. Yum! Mmmmmmm, love your balls..lol..anyways these look amazing and very tasty, something we would all enjoy as a snack! !thanks for sharing!! They are so delicious! We make a batch per week, minimum lol! These sound like kinds of yummy goodness in one perfect bite! I can’t wait to make these with my kids. They certainly are and so easy to make! These sounds so wholesome and delicious!